When it comes to the so-called “C1 building blocks” (in other words, building blocks that lead to straightforward transfer of one carbon unit), formaldehyde is on the very top of my list. This simple chemical acts as a direct precursor to the methylamine fragment that can be put together using a range of condensation reactions. Formaldehyde-derived iminium ions are fantastic starting materials for the Mannich reaction and are known to partake in cascade processes driven by the incipient primary amine units. In this regard, I enjoyed reading the total synthesis of lyconadins A and C by the Dai group of Purdue University. The cornerstone of their synthesis (shown below) demonstrates how formaldehyde takes on a scaffold containing a ketone and an alpha,beta unsaturated ketone, and stitches a complex multi-ring system in one pot. There are three distinct mechanisms one can propose for this process. 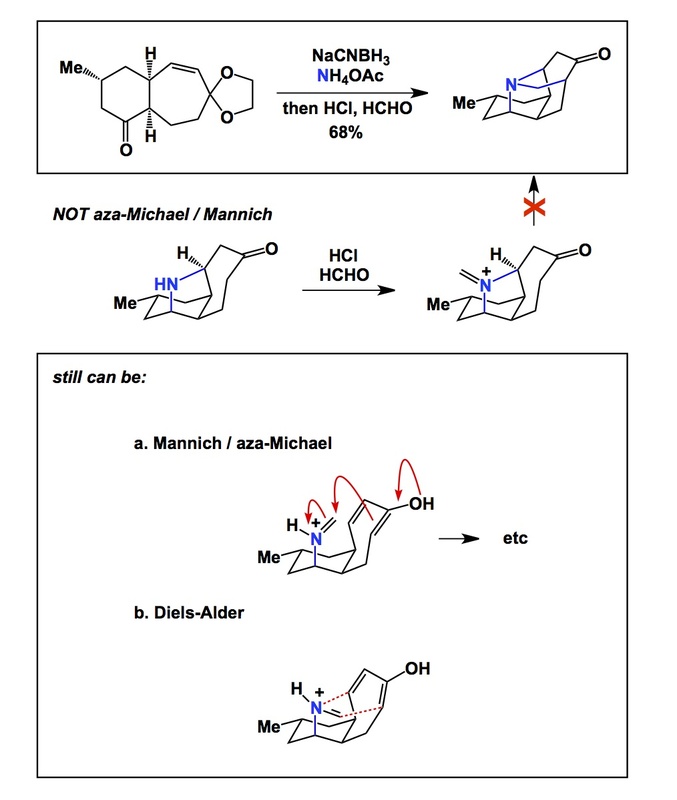 One of them – the aza-Michael/Mannich sequence – can be safely ruled out because the control experiment using the secondary amine intermediate shown below, failed. This leaves two possibilities, neither of which can be ruled out at this point of time. Overall, this gram-scale route opens doors towards libraries of lyconadin derivatives and their evaluation as anti-neurodegenerative agents.